my driveway is a derivative of the teardrop shaped driveway that starts with around 24' double-laned entrance, and then merges into a semi circle with radius 27' with a 5' island in the middle.. is this enough to provide parking for five cars at one time with them being able to pull out easily etc.? ive consulted all sorts of manuals online and they show a variance from 17' turning radius to 40'! so not much help basically. I'm aiming to mostly accomodate sedans or family cars at most so nothing extravagant maybe an occasional SUV but either way I only have space to move the 27' semicircle to 30'. will that be enough? Thanks for submitting your question. The way I understand your sketch, is that the total diameter of the circle is 27 feet with a 5 foot center circle. Your text saids that the radius is 27 feet, but your sketch shows the diameter being 27 feet. If the total diameter of the circle is 27 feet, each side of the diriveway is only 11 feet wide. 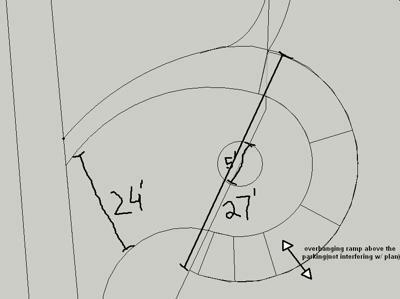 The 27 foot dimension is the diameter of the circle, not the turning radius. The turning radius is calculated by taking a measurement from the center of the circle to the point where it is the most likely for the tires to travel. In your case, the turning radius for the outside tire is about 10 1/2 feet. Check your owner's manual for the turning radius of your car, but this is a tight turn. The width of the driveway allows for only one car without room for another car to pass. You need a minimun width of 18 feet for a car to pass a parked car. It's appears like a small driveway that you may be able to park 5 cars in, but they would not be able to leave without other cars being moved to let them out. As you can see from what I've described above, if your text is correct and the radius is 27 feet, then you should have ample space for the driveway you are trying to acheive since the diameter of the circle would be 54 feet.